SR offers DSP32C Coprocessor boards designed to provide maximum DSP performance in the PC environment. Featuring the Agere DSP32C chip, they offer 50 MHz, 25 Mflop floating point DSP power with 24 bit address and 32 bit data buses for speed and accuracy. All of the boards use a 16 bit PC ISA bus interface to the DSP32C PIO that allows all on board memory to be accessed by the PC while the DSP32C is executing. Also included with each system is a complete software package so you have everything you need to begin developing applications immediately. And, because the boards share a common interface, most application software runs on any of the boards with no changes. For hardware development, each board has headers for direct interfaces to external devices. The DSPSMT and DSPMOD boards have a high speed 12.5 MHz 32 bit parallel port that is completely buffered to drive ribbon cables and provide system integrity. It is memory mapped and easy to program and can be run at the full 12.5 MHz data transfer rate. In addition, all DSP boards except the DSPSMT have a serial port header for interfacing to codecs and other serial I/O devices. Please note that the serial port is not plain RS232, but is instead a high speed serial port to the DSP32C. 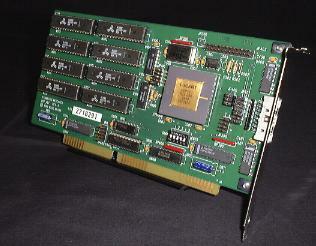 Each board comes with 1 MB of memory and the DSPMOD can be populated with up to 8 MB. Each board also includes 1 DSP32C CPU and the DSPMUL can be populated with up to 4. All the software you need to develop stand alone or integrated PC DSP32C applications comes with each board. This software includes an assembler, full screen symbolic monitor/debugger, C callable math library, and many graded examples to help you get started. Source code for the entire system is included and provides a base for developing custom applications. The PDF user manual includes circuit diagrams. 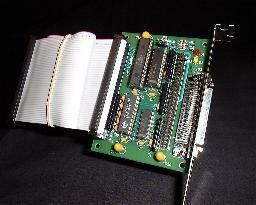 The DSPSCSI interface board connects the DSP32C parallel port to SCSI2 systems. It provides 512 byte deep FIFO buffering and features a selectable capture mode. A 5" cable is included. For info on the DSP32C coprocessor boards see the DSP Product Selector above. Board Dimension: 2.50" x 3.50"